FILE - Members of forces loyal to Libya's eastern government sit near a factory during clashes with the Shura Council of Libyan Revolutionaries, an alliance of former anti-Gaddafi rebels who have joined forces with Islamist group Ansar al-Sharia. Libya's new government and its security challenges are the focus for diplomats Monday as they gather in Vienna to discuss the situation in the country that has been in a state of chaos since leader Moammar Gadhafi was toppled and killed in 2011. The talks follow Kerry's visit Sunday to Saudi Arabia where he sought that government's support in strengthening a cessation of hostilities agreement between Syrian government forces and rebels ahead of broader talks on regional crises later this week. 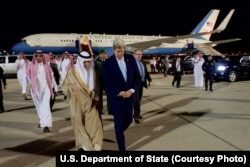 U.S. Secretary of State John Kerry, right, walks with Saudi Arabia Foreign Minister Adel al-Jubeir, at Jeddah International Airport in Jeddah, Saudi Arabia, May 14, 2016. Kirby commented on Friday, shortly before Kerry departed on a two-week trip to the Middle East, Europe and Asia, where he will focus on issues including unrest in Syria as well as in Libya.